Anyone who eats real food on a regular basis most likely plans their meals as well. Food is expensive and planning helps to reduce waste. Meal-planning is a key component to the whole Juggling process. How can I race home to eat a crock pot meal before the Girl Scout meeting if I haven’t planned ahead? I need to know that morning or the evening before that I am making it. I have to say that I was reluctant to meal plan when I was first married. I don’t know……it just didn’t seem cool to me. I would go to the grocery store and just pick out what looked good. All the time, I had to run to the store for things that I forgot or I had to do without. I often had cupboards and a refrigerator full of food and nothing to eat. Has this ever happened to you? When I first switched to eating real food, I decided to give meal- planning a try. I printed out a meal-planning calendar and went to it. I quickly realized that the meal-planning calendar was missing a key component for me. I needed to know what was going on each evening to better plan my dinners. I envisioned a meal planning calendar where I could also include the day’s activities. This way I could see the days that were busy and those that were less busy. My strategy for Juggling Real Food and Real Life is to use what I call “pockets of time“ to prep food for the week. I wanted a meal planning calendar that I could easily see at a glance where these pockets of time are. I also thought it would be helpful if my meal-planning calendar included a spot for me to jot down the prep work that needed done ahead of time. If I want to quickly toss together my Zesty Crock Pot Italian Pasta soup in the morning then I jot down chop onions and brown Italian sausage on the calendar for the night before. Dare to dream! 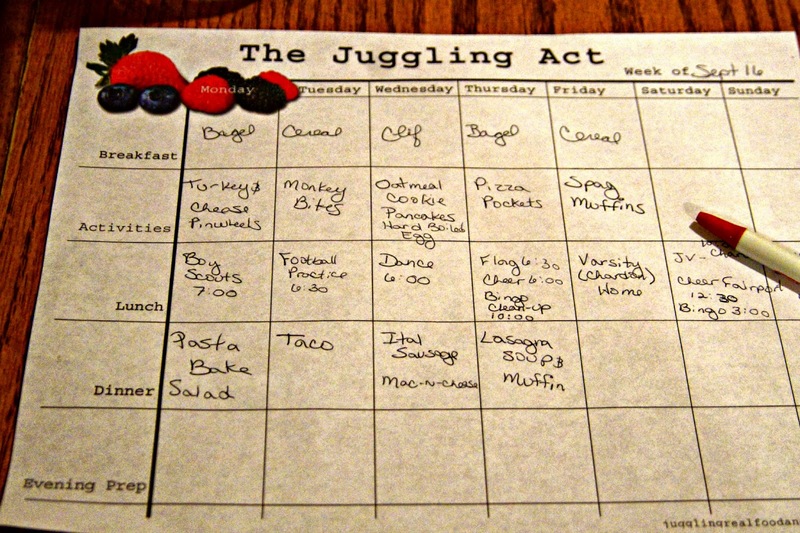 I really wanted a custom meal-planning calendar that would work for our new Juggling lifestyle. I searched high and low and didn’t find anything that was exactly what I wanted. Enter………the brother-in-law. My brother-in-law has an amazing graphic arts (or something amazing like that) education. He works with multiple computer screens at one time and knows how to create 3-D images. So cool! He even worked on a commercial that was in the Super Bowl. You know that means he is good. I finally worked up the nerve to ask him to help me with my meal-planning calendar dream. I was embarrassed to ask him to work on something so simple when he was trying to meet so many important deadlines. Being the great guy that he is…….he eagerly agreed to help me and got it done in like 5 minutes. It probably took him longer than that, but not much. I would still be trying to design something that looked nice. Who am I kidding……I would probably still be chatting with you on Facebook and thinking about trying to create a Juggling Real Food and Real Life calendar. I’ve got to tell you! This calendar has changed my life. It works exactly as I had dreamed. My brother-in-law emailed the meal-planning calendar to me when I was at my last Girl Scout campout. I squealed with joy and showed everyone who would look. I wanted to test it before sharing it with you so I’ve been using it for a while. As we say when we are ready to give birth……….It’s time. If you use it as it is intended, you will find yourself much more organized. We all know how being organized helps save our sanity. A few tips………..Fill in all of your weekly activities first. Then go back and fill in your meals. Be realistic about your time. If you are going to be out till 11:30 because you are cleaning up after Bingo at the high school (insert your late night here) don’t plan to make lunches that are going to have to bake for a half hour. You need to go to bed sometime, you know. Don’t plan to make waffle sandwiches which are quick and easy…………before you have made the waffles. Take some time and really think through your plan. Include like-ingredient items to reduce waste. I buy mushrooms, peppers, and onions and plan on homemade pizzas one night and veggie omelets another. The time you spend planning will be returned to you in time saved by being organized. You can print the free meal-panning calendar here and it is also housed under the meal planning tab at the top of the blog. Download the PDF and print as many as you like for your personal use. Remember my brother-in-law created it so you can’t sell it. The calendar prints out cleaner than it looks electronically. Not sure why, but it’s true. Let me know what you think of the calendar. Do you meal plan already? What have you found to be your biggest time-saver? What a great idea to include family activities right on your calendar! 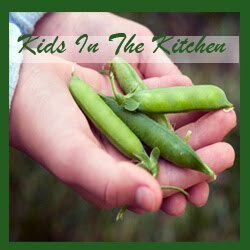 Including family activities is really a help to me when planning meals. 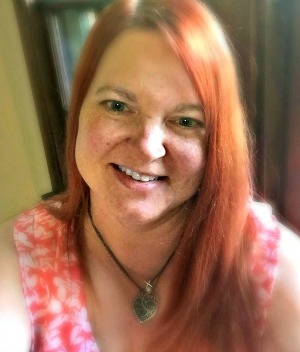 If I'm going to be late, but my husband is going to be home…….I plan something he likes to cook. No time at all………that is a crockpot night. I keep trying meal planning but obviously it's not working. I've printed out different planners and tried to stick to it but some kind of way, I get off schedule. I do like that you've included a prep section and included activities to work into the schedule. The design is really cute…. I was never very good at meal planning. I actually thougt people who planned were a bit strange. That all changed when I made my committment to the real food lifestyle. Planning is essential so we don't go hungry since fast food is no longer an option. Give it a try. It takes a while to create a habit, but you will appreciate the organization. I have been horrible at meal planning lately. I used to be a pro at it. Even a whole month in advance. Now I have become that mom who has no idea what is for dinner until we are past starving. Not good! This reminded me to be better. Oh Janine! I know what you mean. Past starving is no time to make healthy food decisions. I have to avoid that at all costs. I don't know if I could do a month at a time, but my weekly meal and activity calendar are working really well for me. There's nothing like having your own, custom printable 🙂 Looks great! Thanks Nicole! It really was exciting to get the email from my brother-in-law. Dream come true! Including activities is so smart! Including the activities helps me to be realistic about my time. No need to plan a 5 course meal when I know I won't get home from dance class till 8:00. It's just not going to happen so I plan something that will work for us. Don't beat yourself up about it Chrystal. Every new habit takes time to develop. Give it a try again. You might find that the benefits cause you to make meal planning a priority.